Located in the rich, diverse Irvington neighborhood of NE Portland, our urban campus serves families with children Preschool through Grade Eight. We offer an affordable Waldorf curriculum, and have a vibrant and involved parent community. Our school was founded in 2003 with the intention to offer classroom education mixed with outdoor nature immersion. We offer traditional and Waldorf arts, music, and handwork with a talented and diverse group of dedicated teachers of the highest caliber, who care deeply about their work and the children. We believe that the development of a child’s sense of beauty, wonder and interest in the world of nature and all humanity is key to becoming a balanced and truly healthy adult. Based upon the teachings and insights of Rudolf Steiner the curriculum nurtures the imagination, cultivates a love of learning, awakens a sense of moral responsibility and strengthens the intellect and will. Shining Star Waldorf School provides an environment conducive to the development of free human beings, capable of imparting purpose and direction to their lives. We strive to educate the heart and hands, in addition to the head, in a developmentally sensitive manner. We work consciously in our dedicated effort to create an accessible Waldorf education that prepares children for today’s world. Our community is strong and founded on the principles of collaboration and community involvement. As a smaller school we offer a rich and varied curriculum with a small number of faculty and smaller infrastructure with plenty of parental involvement. We reinvent ourselves each year with new members of our community and new children who enroll. A close-knit, family-centric community, making class sizes smaller with an average of 14 children. 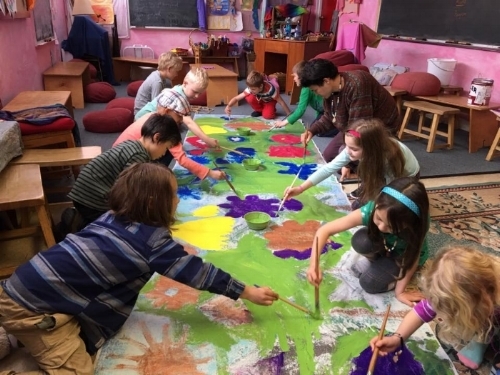 We strive to offer accessible and affordable Waldorf education to families from all walks of life using a unique 5-day week structure. Monday through Thursday children spend at our campus: in the classroom, in our garden, and playing in our large play yard. Fridays are spent outdoors in our Nature Immersion program. Fridays are a very special offering, unique to our school. An amazing opportunity to be immersed in nature, at various outdoor locations around the Portland Metro area. Shining Star is a member of AWSNA (Association of Waldorf Schools of North America.) Our school offers diverse education in subject matters such as Handwork, Music, Strings, Choir, Band, German Language, Folk Dance, games and so much more. We are located in a sunny lower-level of a large church located in the beautiful Irvington neighborhood of NE Portland. Children enjoy a large paved play area equipped with basketball hoops, a garden space for growing vegetables, as well as a hand-made sand box tucked into the corner. Two blocks away is the Peace Park, a lovely private green space with labyrinth and play space for recreation.